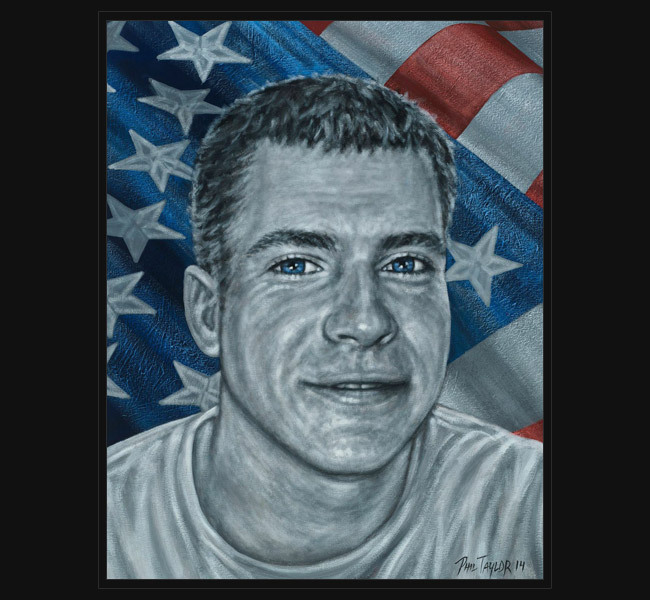 Army SFC Houston Taylor died October 13, 2011,when insurgents attacked his unit with small arms fire while he was on foot patrol in Kunar Province, Afghanistan. “I love you” were the last words we said to each other. SFC Taylor has been awarded the Bronze Star Medal, Purple Heart, Army Commendation Medal (2 Oak Leaf Clusters), Army Achievement Medal (3 Oak Leaf Clusters), Meritorious Unit Citation, Army Good Conduct Medal, National Defense Service Medal, Iraqi Campaign Medal with 3 Bronze Stars, Afghanistan Campaign Medal with Bronze Service Star, Global War on Terrorism Medal, Army Service Ribbon, NATO Medal, and Combat Infantryman Badge. Original portrait was presented July 4, 2014 to his family during the Independence Day celebration at FC Dallas in Frisco, Texas.